Two Swiss students have created what could be the largest portable ink jet printer in the world. Called Hektor, the printer built by Jürg Lehni and Uli Franke converts small computer created images into huge facsimilies that it recreates with cans of spray paint. Hektor can be mounted on any wall and the spray can at its heart is moved with two independently controllable pulleys. 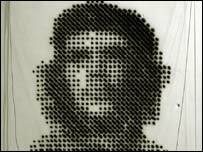 The machine was nominated for an award at the 2003 Machinista media art festival. Hektor was built for Mr Lehni's diploma project in the School of Arts and Design in Lausanne, Switzerland. He came up with the idea, which he describes as a graffiti robot rather than a printer, when thinking about novel ways for an artist to turn computer-drawn images into something more concrete. He wanted to combine the precision of computer-generated images with the woolier outlines produced by spray paint. The machine suspends a spray paint can using two toothed belts that feed through a pair of motors. Working together the two motors allow the paint can to be positioned anywhere inside the box they define. The spray can is held in a custom-made harness that controls when and how long it sprays paint on the wall it faces. All the parts for Hektor fit in one suitcase making the whole device portable and adaptable to almost any surface that the motors can be attached to. Mr Lehni also created a program that converts images created with Adobe Illustrator into files that Hektor can paint onto walls. 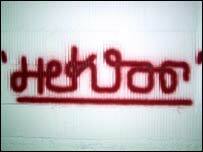 Writing about the creation of Hektor, Mr Lehni said one of the hardest parts was designing the path-finding algorithm that works out the most efficient route for the can to trace out and paint an image. Now it is fully working Hektor can reproduce almost any image in a fashion that "is obviously not sprayed by a human". Hektor has also been used to help create a work of art by Cornel Windlin in an exhibition held at the Zurich Kunsthaus gallery and has been shown in many other galleries and art spaces.